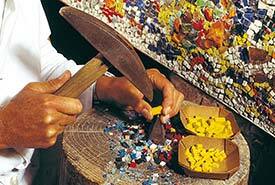 ABOVE: Preparing tesserae of smalti, or opaque colored glass, for mosaic work. INSET BELOW: A close-up of tesserae in two of Orsoni's 2,000+ hues, and the entrance to the Domus Orsoni bed-and-breakfast. Course fees include equipment and materials, an Orsoni apron, and (for the longer courses) guided tours to Torcello and/or the Basilica di San Marco, which are famous for their glass, gold, and stone mosaics. Photos copyright © Angelo Orsoni s.r.l.